In the wake of Saturday’s shooting in Arizona, leaving among the dead a federal judge and a 9-year-old, with Congresswoman Gabrielle Giffords in critical condition among the many wounded, life insurance company AccuQuote reminds surfers of CNN that our family’s future is uncertain (even if widowhood turns women into FOXES… part of the threat of death, perhaps? )… especially with that unknown person of interest still on the loose. I know how internet advertising works. When not random (though I doubt this is random), it’s keyword correlated, in effort to show viewers relevant content. And life insurance is definitely relevant when a sociopath murders citizens and public servants at a community forum. But c’mon, AccuQuote and CNN. Have some taste and show respect. 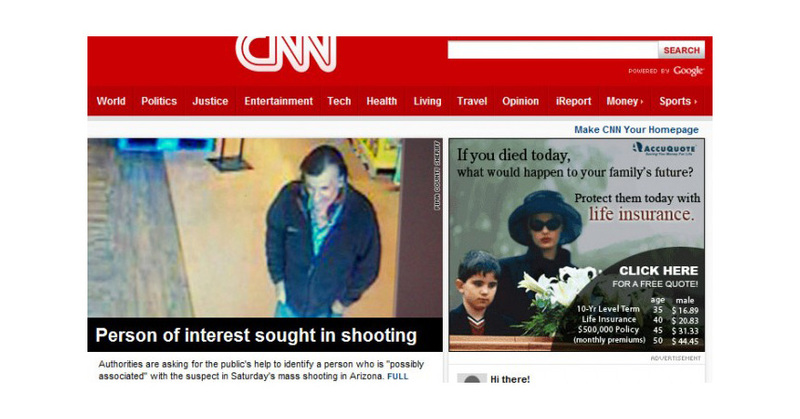 …Though I suppose such a censure ignores that media orgs are always selling fear, mayhem and ad space. Ugh. Our thoughts are with the victims of the tragedy. May we see a shift in political and cultural discourse toward the sane and peaceable. Posted by Meg Holle in Death + Crime, Death + the Web and tagged insurance, marketing. Bookmark the permalink.